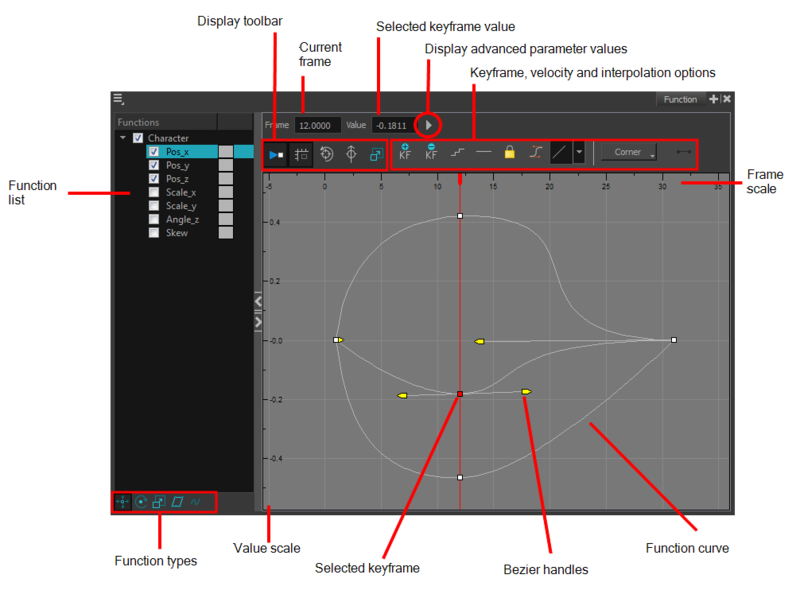 The Function view lets you edit function curves and parameters. 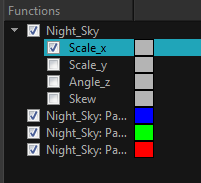 It is a visual graph for adding, removing, and editing keyframes, as well as adjusting the velocity. The Function view allows you to display multiple functions in the background as a reference. When selecting a layer in the Timeline view, all the corresponding functions are displayed. Select all the functions you want to see and edit; hide the ones you don't. Display Toolbar The Display toolbar allows you to modify how the editing area is displayed. You can hide the grid, disable the synchronization with the current frame, reset the zoom level and normalize the function display by stacking them one over the other to compare them regardless of their value range. Bezier Handles The Bezier handles let you adjust the ease in and ease out of each keyframe. The more the handle is pulled out horizontally, the slower the animation will be. The more the handle is pulled out vertically, the faster the animation will be.